These Vegan Loaded Smashed Potatoes are coming to you straight from my childhood. They are reminiscent of the loaded potato skins I used to eat at the local Friday’s restaurant in Tampa, FL. Before I discovered that chain restaurants aren’t as cool as I thought they were and that dairy cheese and bacon come from sources I’d like to avoid. Back then my parents used to take us to Friday’s every other week or so. It was always a big deal cause money was tight and we didn’t eat at restaurants that often. The restaurant had a double decker vintage phone booth that was super fun to play in and I always loved our time there. The recipe for these Vegan Loaded Smashed Potatoes may seem complicated, but I assure you it’s not! They come together pretty quickly if you keep vegan mozzarella and cashew cream on hand, like I always do. If you don’t, well I highly recommend you start! There is a better future for you in the world of snacking. I should know, I’m basically a snacking expert. The easiest way to make this recipe is to double the recipe for our 20 Minute Vegan Quesadillas. Then you’ll have quesadillas AND Vegan Loaded Smashed Potatoes. See? Snack Expert! These loaded smashed potatoes taste so good, you won't believe they're vegan! Topped with cashew mozzarella, chipotle cream, tempeh bacon bits, and chives. So much flavor in such a small bite. Combine all liquid ingredients for the tempeh bacon in a container with a lid, except for the coconut oil. Chop the tempeh into very fine bits and toss it with the marinade. Let sit while the potatoes boil. Bring a pot of water to boil with a sprinkle of salt. Boil the potatoes until fork tender, about 10 minutes. Preheat the oven to 450. When the potatoes are cool enough to handle, use a metal spatula or the bottom of a glass to smash them until they are about 1/2-3/4 inch thick. Transfer the potatoes to a baking sheet lined with foil and a small amount of oil. Drizzle the potatoes with 3 tbsp olive oil and bake for 20 minutes. 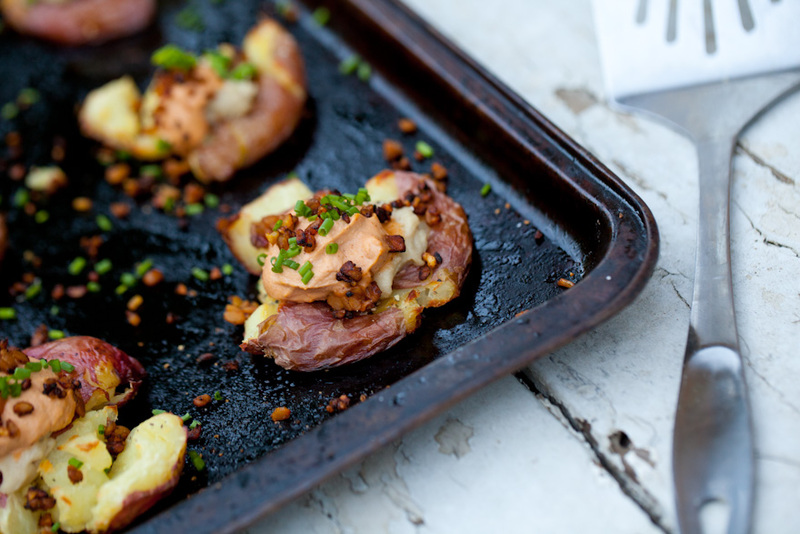 While the potatoes are baking, prepare the cashew mozzarella, chipotle cream, and tempeh bacon bits. Remove the potatoes from the oven and top each one with a spoonful of cashew mozzarella. Bake for another 5 minutes until cheese becomes melty. Finish each Vegan Loaded Smashed Potato with a large dollop of chipotle cream, tempeh bacon bits, and chives. Soak the cashews for two hours or overnight to soften. I recommend keeping soaked and drained cashews on hand in your freezer to speed things along. You can also boil them for ten minutes to save on time. In a high powered blender, add the soaked cashews and remaining mozzarella ingredients. Blend on high for two minutes until mixture is smooth. Transfer to a saucepan on medium high heat and stir until the cheese forms a gooey ball in the center, about 5 minutes. Marinade the tempeh bacon according to instructions above. After 10-15 minutes, melt the coconut oil in skillet over medium heat. Add the marinated tempeh bacon bits to the skillet and cook for 10-12 minutes, stirring often to prevent sticking. You want the tempeh bacon bits to be a bit blackened and sticky. You may have to add a bit more oil or water to deglaze the pan as you go. Soak the cashews for two hours or overnight, then drain. Add the soaked cashews to a high speed blender with remaining ingredients and blend on high for 2-3 minutes until smooth. *Use a non-stick pan to make the tempeh bacon. The glaze tends to stick to the bottom of the pan and is easily scrubbed off with steel wool. *The vegan mozzarella, tempeh bacon bits, and chipotle cream will stay fresh in closed containers in the fridge for up to five days. You will have leftovers from this recipe. Did you try this Vegan Loaded Smashed Potato recipe? We want to hear how it went! Leave us a comment below or post a photo of your delicious snack to Instagram with the tag #carrotsandflowers 🙂 We love that! If you loved this recipe, check out our 10 Minute Vegan Chili Cheese Nachos and our Pesto Pasta Salad for more mouthwatering savory vegan snacks like the Vegan Loaded Smashed Potatoes. To save this recipe for later, simply pin the photo below!